From the menu, select File → Score Properties (File → Info... in versions earlier than 2.0.3). Several meta tags are generated automatically when you create a score using the New Score Wizard, and others may be added later. Meta tags can also be incorporated into a header or footer if required—see below. 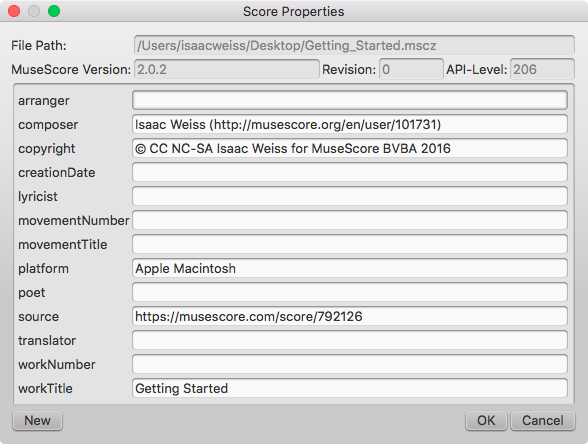 Every score has the following fields available in Score Properties. Some are automatically filled in on score creation, while others will be empty unless specifically changed. The first four items in the following list are not user-modifiable, and cannot be used in the header or footer (they are not really meta tags). File Path: The score file's location on your Computer (2.0.3 and later). MuseScore Version: The version of MuseScore the score was last saved with. Revision: The revision of MuseScore the score was last saved with. API-Level: The file format version. composer: As entered in the New Score Wizard (which is also used to fill the composer text in the top vertical frame—be aware that later changes to one are not reflected in the other). copyright: As entered in the New Score Wizard. Copyright info appears as seemingly uneditable text at the bottom of every page of a score, but it can be edited or removed by changing the value here. creationDate: Date of the score creation. This could be empty, if the score was saved in test mode (see Command line options). lyricist: As entered in the New Score Wizard (which is also used to fill the corresponding lyricist text in the top vertical frame—be aware that later changes to one are not reflected in the other). originalFormat: This tag exists only if the score got imported and then contains the format the score got imported from (see file formats). platform: The platform the score was created on: "Microsoft Windows", "Apple Macintosh", "Linux" or "Unknown". This might be empty if the score was saved in test mode. source: May contain a URL if the score was downloaded from or saved to MuseScore.com. workTitle: As entered in the New Score Wizard (which is also used to fill the corresponding title text in the top vertical frame—be aware that later changes to one are not reflected in the other). When working on multiple scores that belong to one larger work, the nomenclature is like this: workNumber and workTitle are the number and title of the larger work (e.g. opus 8, “Le quattro stagioni” (The four seasons) by Antonio Vivaldi), movementNumber is the number of the movement you’re working on (e.g. 3 for Autumn) and movementTitle is its title (“L’autunno”). It is customary, when using the New Score Wizard, to create a work with the movementTitle as title (even though it ends up in workTitle then) and, directly after creating the score, fixing up this information in the Score Properties dialogue. 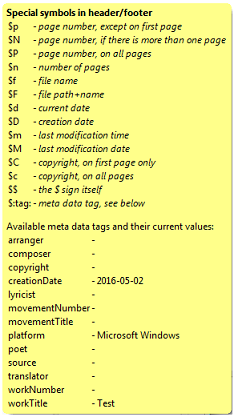 This ensures that the title frame of the printed score contains the information you expect but the metadata is also correct. partName: Name of the part as given on part creation (which is also used to fill the corresponding part name text in the top vertical frame—be aware that later changes to one are not reflected in the other). If you hover with your mouse over the Header or Footer text region, a list of macros will appear, showing their meaning, as well as the existing meta tags and their content. 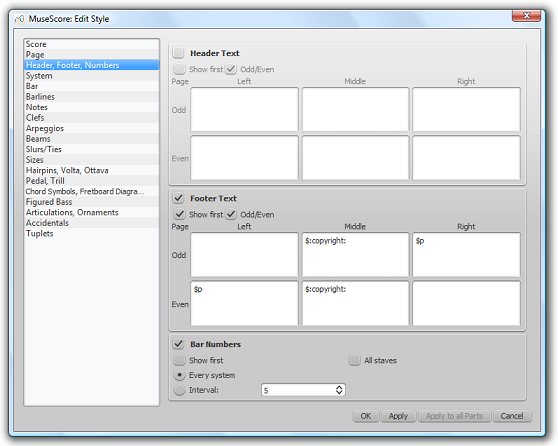 Click OK to assign the header or footer and exit the dialog.